I thought I heard horror stories about JLA: Crisis of Conscience, but maybe it was World Without a Justice League , because I thought this volume was pretty good. The action is somewhat scattered--I never quite understood how it was that Despero came back to life, or why this world-conquorer was so concerned with a bevy of minor super-villains--but Johns and Heinberg more than make up for it with some excellent character moments. 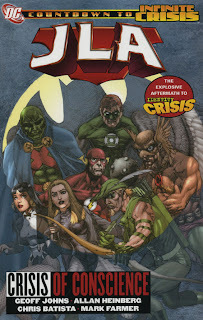 From Hawkman calling out Superman to make the final decision on the mind-wipes, to Wonder Woman and Zatanna's heart-to-heart (and lead in to Seven Soliders), to a distinctly Meltzer-ian revelation that Batman's concern about the mindwipes surrounds Selina and not himself, to the full-circle Martian Manhunter moment when he realizes that much of this scenario is due to his own snubbing of Blue Beetle in Countdown to Infinite Crisis , a lot of the emotion that played out in Infinite Crisis begins here. Well worth the read before continuing on.